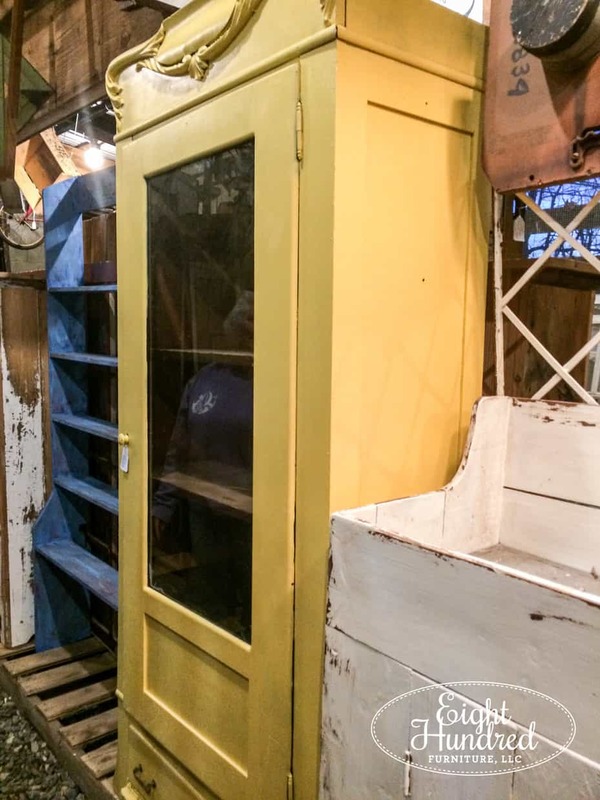 When I first saw this yellow wardrobe at Crickets Antiques and Garden Market, I was in love. It literally stopped me in my tracks. all the way up to the sweeping decorative trim on the top. The door was wonky and crooked but it had the original glass. There were also 2 shelves missing inside. I wanted to get it but the price scared me away. Plus, it’s 7 feet tall, so I couldn’t just buy it on a whim. I had to think it through and decide if I really wanted to tackle something this big and expensive. As time went buy, I would stop in at Cricket’s to see what goodies had just come in. The yellow wardrobe sat quietly on pallets as I passed it time and time again. Finally, a few weeks ago, I went to ladies’ night out on a Thursday. As I browsed the aisles, nibbling on goodies and sipping on spirits, I stopped in front of the wardrobe. Cricket came by and we started chatting. The wardrobe sat in my living room for a little bit because I had to wrap my head around the repairs it would need. We strapped the door shut because it kept swinging open. The bottom didn’t line up properly so it wouldn’t shut. 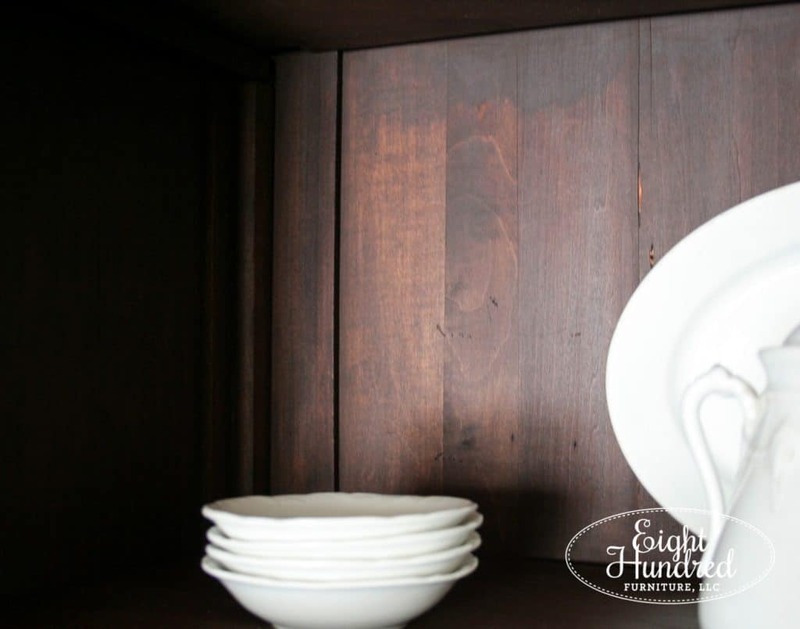 The drawer on the bottom was in pretty good shape and the existing shelves were solidly nailed in place. All it really needed was a simple sprucing. 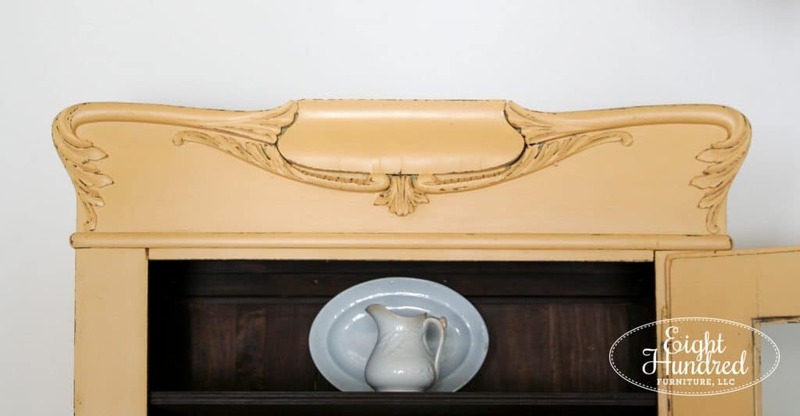 The existing yellow paint was latex and it was unevenly applied. 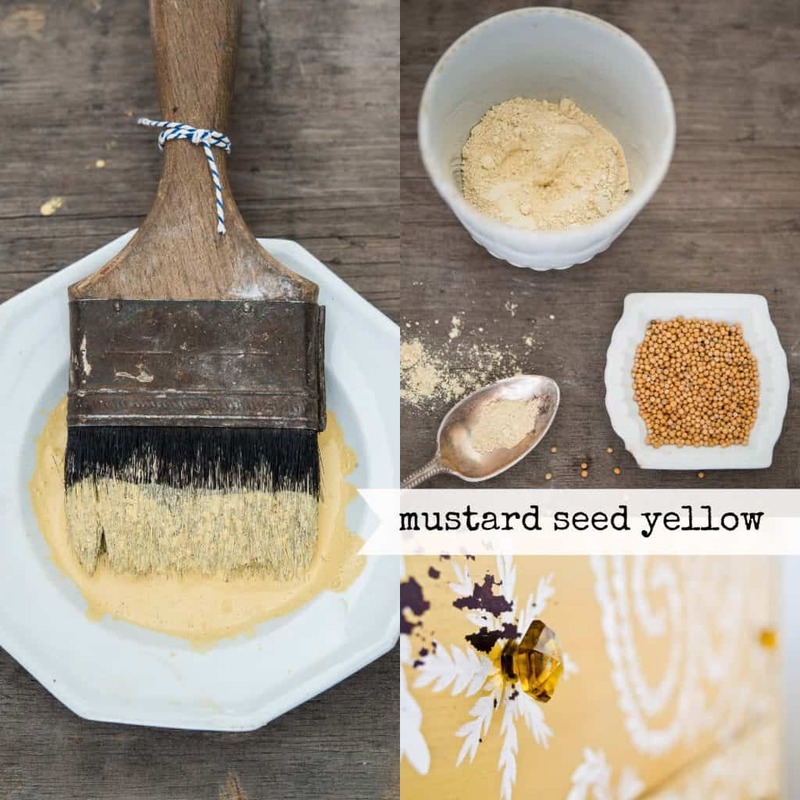 I really liked the yellow color, so I decided to paint it in Miss Mustard Seed’s Mustard Seed Yellow. 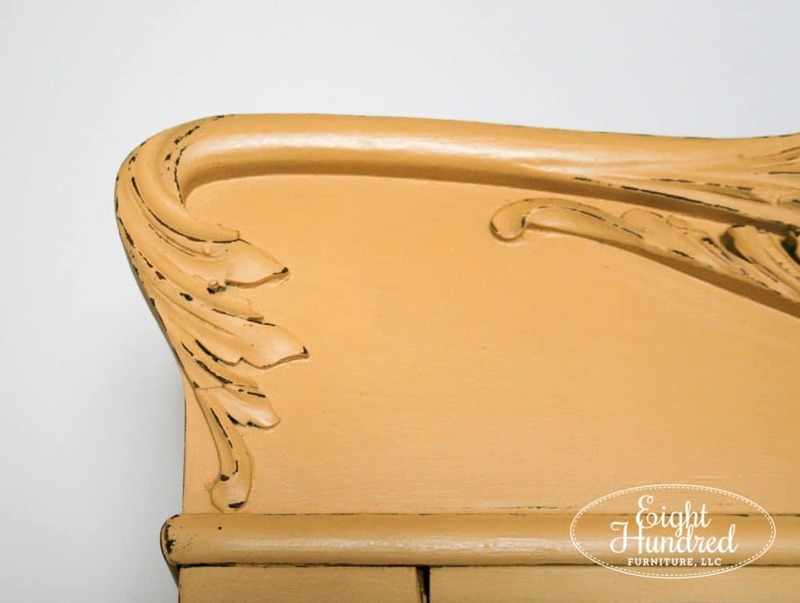 After a cleaning with mineral spirits and an overall scuff, the Milk Paint went on just fine with no Bonding Agent needed. My Dad came with me to Home Depot so we could sort out what kind of wood I should get for the 2 replacement shelves. We decided on 3/4″ plywood and he cut them to size for me. Once I got them home, Marc and I rearranged the supports on either side so the shelves were roughly spaced out evenly. There’s about a foot of space in between each one. 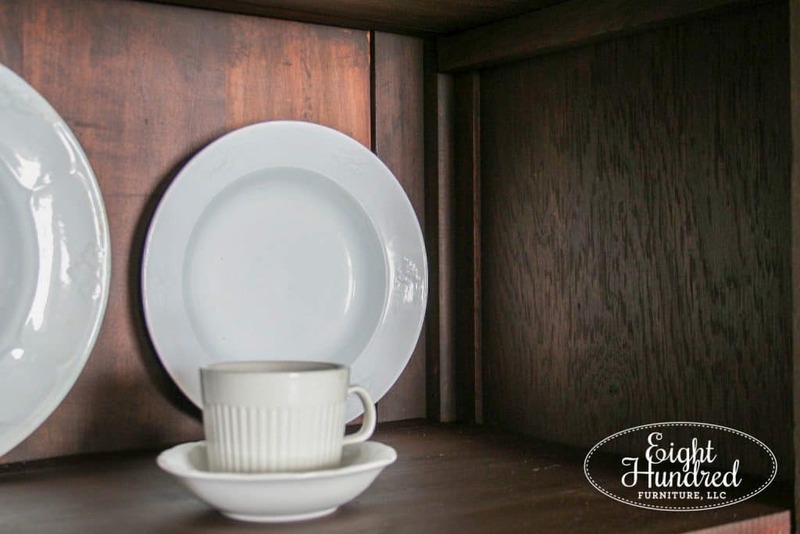 The inside of the cupboard had been stained, but the shelves were now uneven in color. 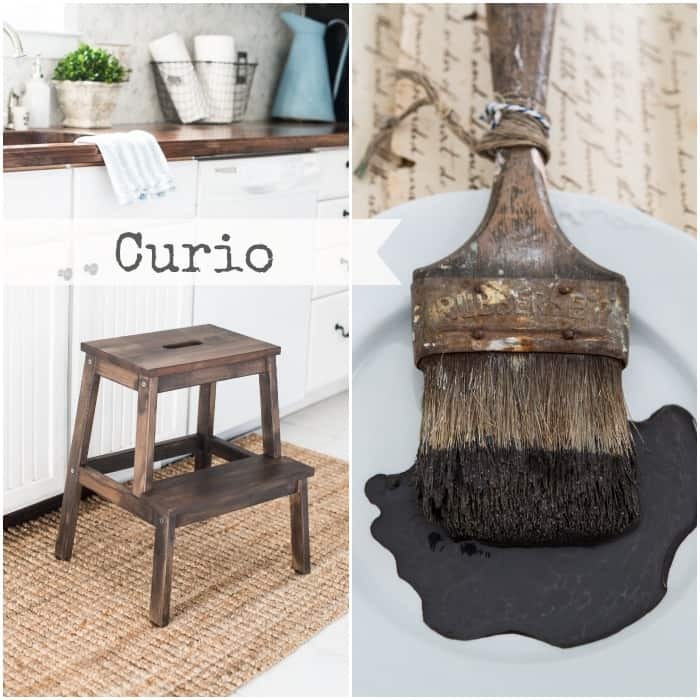 I wanted the interior to be uniform, so I mixed equal parts Curio and Typewriter with 2 parts water to make a dark stain. 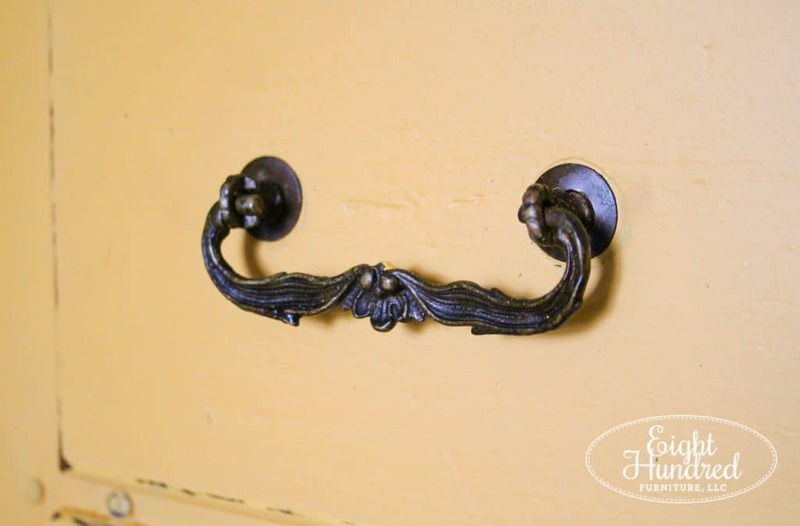 I brushed my Milk Paint stain all over the inside, which took almost an entire day. This wardrobe is 7 feet tall and has 5 individual little cubby spaces. There are angles, nooks, and ledges all over the place and I wanted to do a really good job. 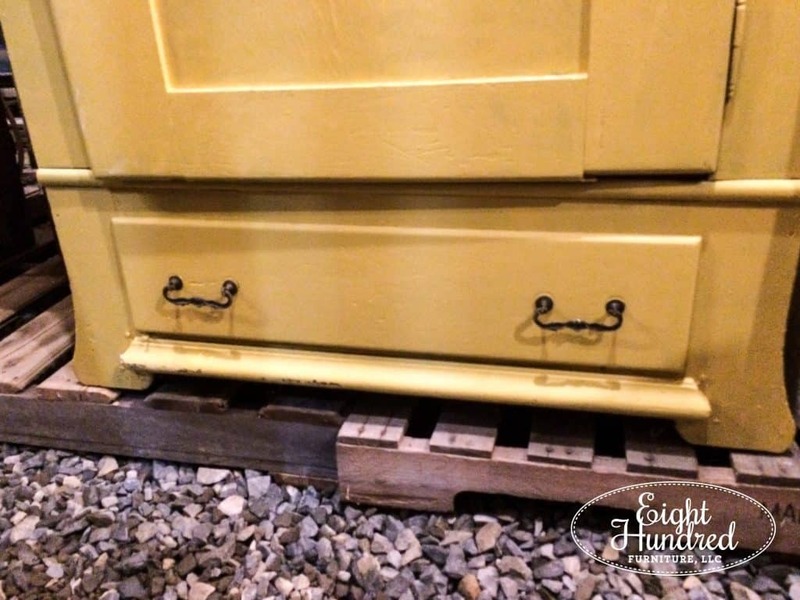 Plus, the wood was really dry so my Milk Paint soaked in quickly. Once the piece had been completely Milk Painted, I applied Hemp Oil all over the inside and outside. This process took about 3 days. Again, this wardrobe is really big and I broke it down into stages. I’d do a cubby and take a break. Come back and do a drawer. Go do some laundry and work on the top. It was too much to do all at once. 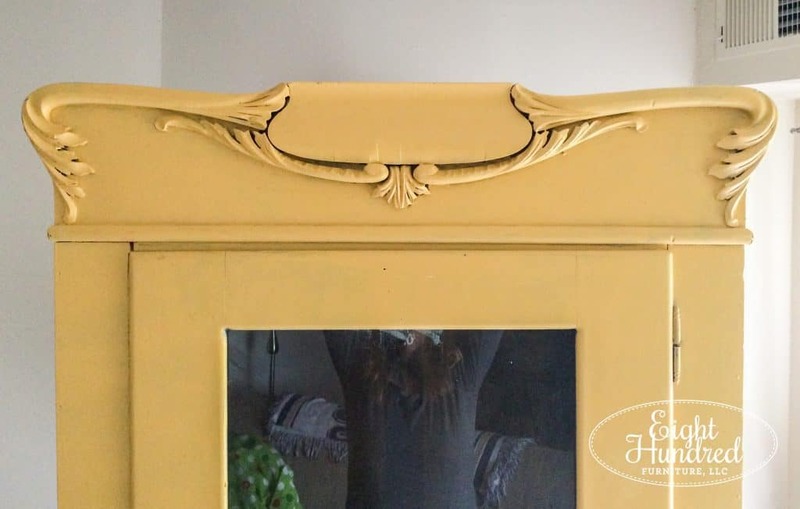 From start to finish, this makeover took me about 3 weeks between acquiring the shelves, getting new glass cut (because I…ahem…broke the original glass), painting, oiling, and wiping. It was sooooo worth it though because the wardrobe looks amazing! Can I just say how hard it is to photograph a piece that has glass on the front? This is the only blank wall in my apartment that could fit a 7 foot tall piece of furniture, so I did the best I could with the glare. Didn’t the inside turn out so well? 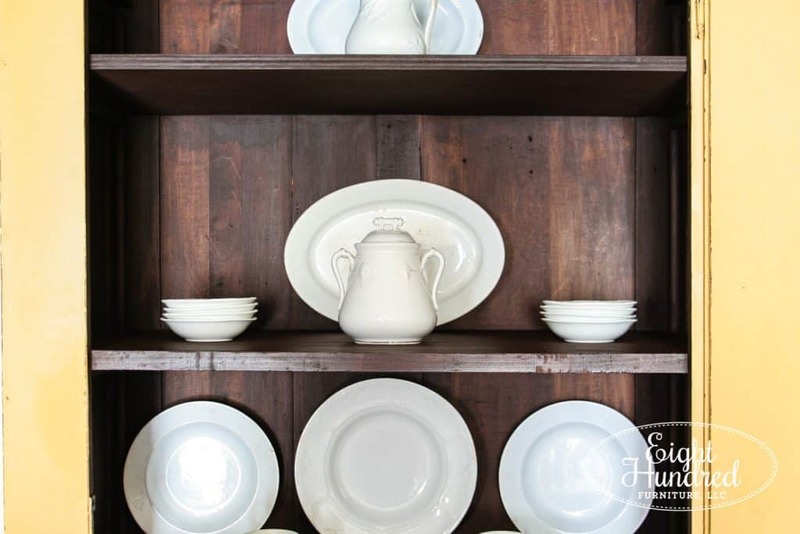 You can’t really tell which shelves were new and which were original. Just look at that top! Doesn’t the trim remind you of wings? 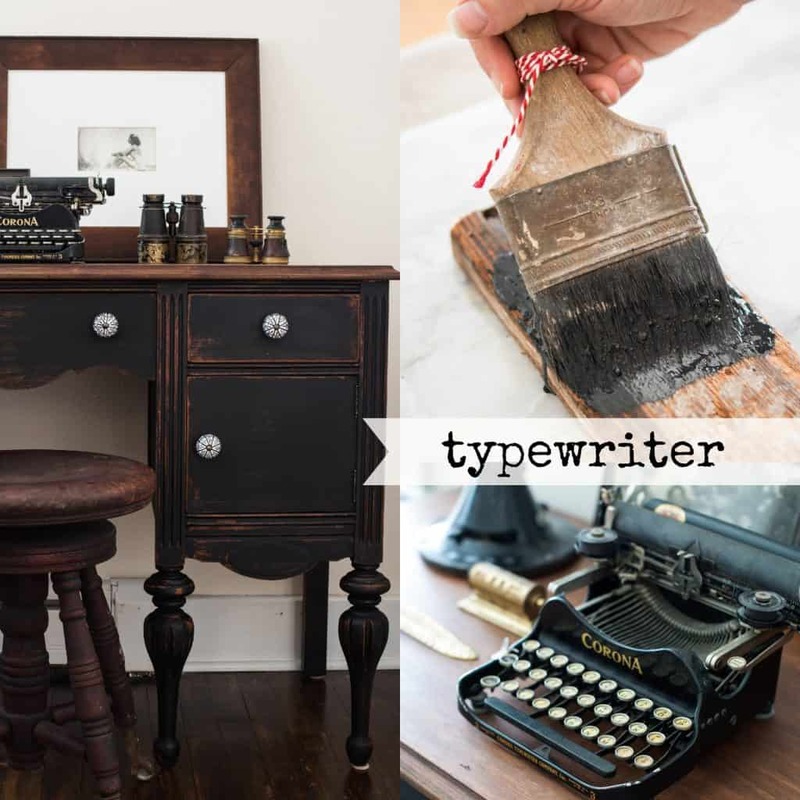 The Typewriter/Curio stain blend made for a ridiculously rich interior. Here’s a close up of that stain. I’m so pleased to see my white ironstone popping against such a rich background. 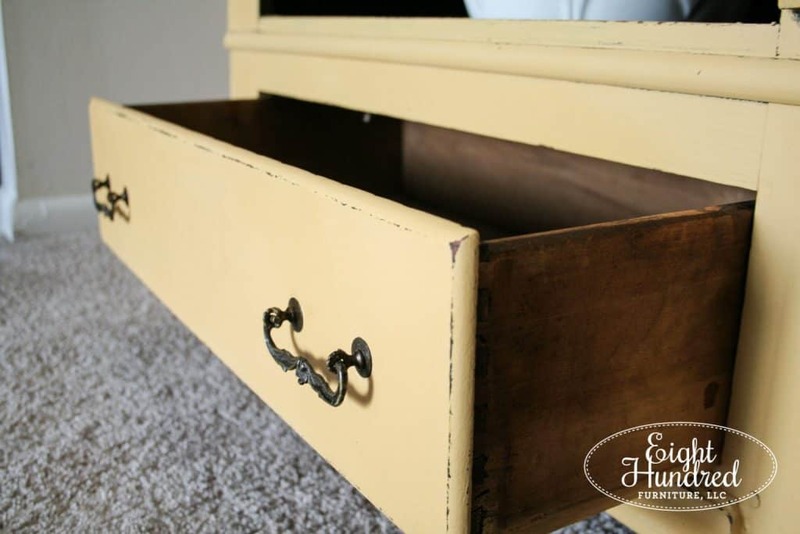 I kept the original handles on the drawer and shined them up with some Hemp Oil. 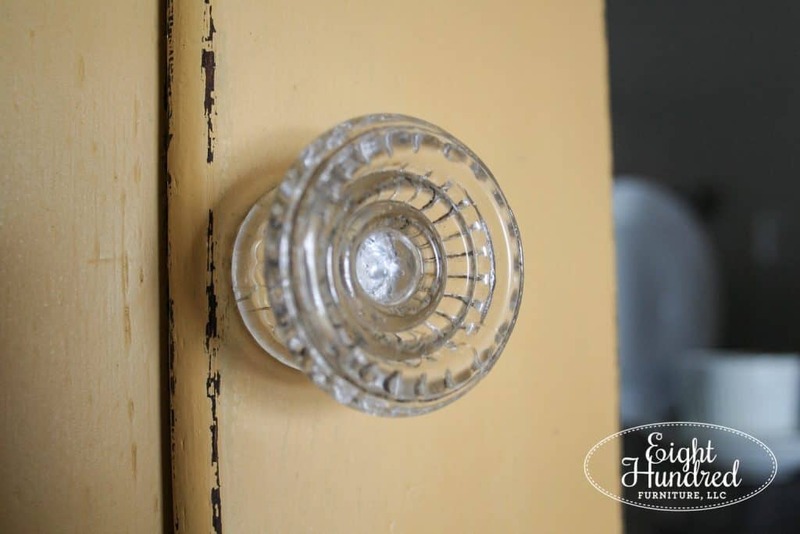 I did take off the wood knob it came with and replaced it with a chunky antique glass knob. 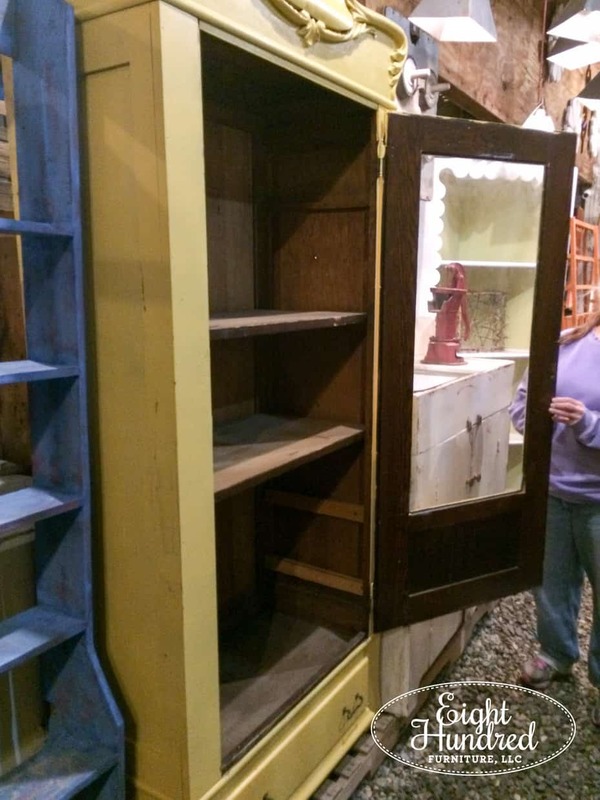 This cupboard was supposed to make it over to Morgantown Market, but Tiffany of Blue Dandelion in Strasburg snapped it up through Instagram! 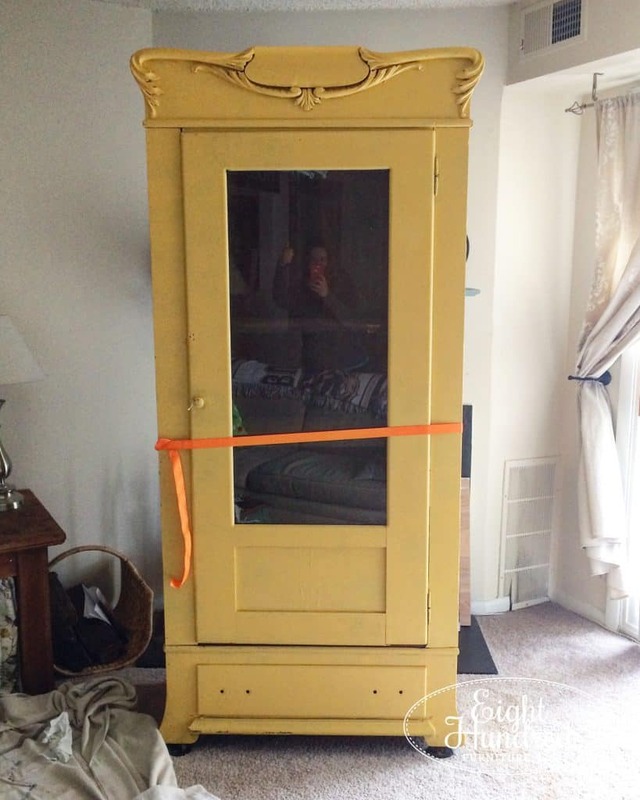 This is the first piece of furniture that sold before I could get it to the store. I’m so glad it’s going to a friend who will love its features just as much as I do! Overall, this wasn’t really a makeover so much as it was a “spruce”. 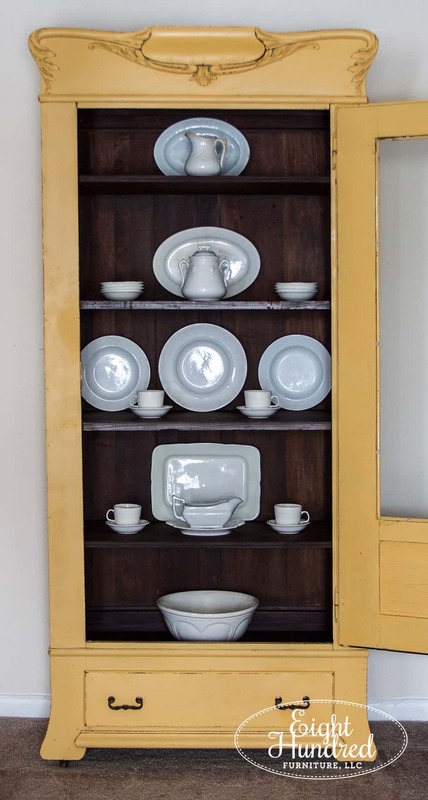 Fresh paint, new shelves, and a uniformly stained interior have made this piece fabulous once again.